Gustav Klimt’s renowned painting ‘Portrait of Adele Bloch-Bauer’ (also known as ‘The Lady in Gold’) has been a constant inspiration to the artistic world and to those who admire Klimt’s unique art detailed in gold tones. Characterized by a luxurious two-toned jacquard pattern, the ‘Sinatra Sandal’ and ‘Sinatra Bootie’ are highlighted with precious trimmings and finished with a slim stiletto heel. Whilst the ‘Brooklyn Bootie’ features a block mid-heel defined by its distinct jacquard embroidery. The ‘Powder Puff Flat’ and ‘Powder Puff Sling’ present a parallel theme to Klimt’s mosaic symbolism during his golden phase. 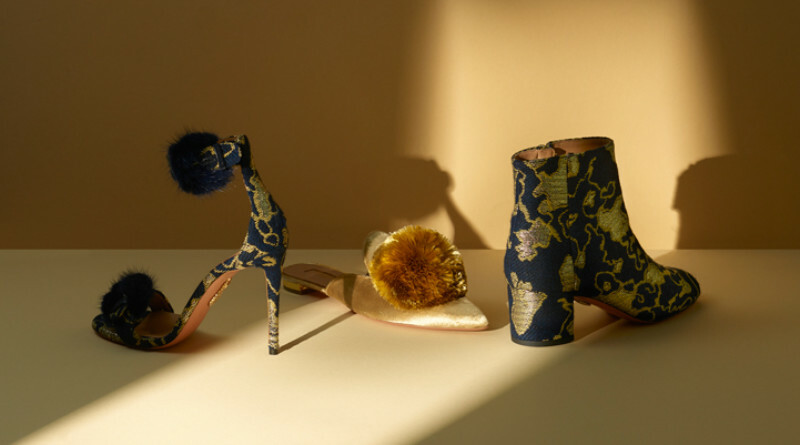 Crafted in Italy from glistening gold velvet, the two styles present the AQUAZZURA iconic ‘Powder Puff’ embellishments.